Phill Turton shares his Yorkshire Ultra Experience. 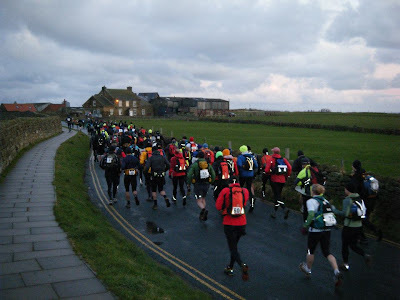 The Yorkshire Ultra or "Frostbite 50" was my first forray into the "underground" world that is ultra running. It is a world that I had wanted to enter since stumbling across the book "Ultramarathon Man" 2 years ago in which this insane guy Dean Karnazes describes his life as an ultra runner and taking part in races that were anything between 50 and 200 miles. In short I thought this bloke was a modern day superman but the more I read, the more I researched the more I realised that Karnazes was simply one of a band of runners for who a marathon had simply become a training run. After completing my first trail marathon in Kielder in October 2011 I decided to take the plunge and entered the Frostbite 50 in January of 2012. This gave me just 3 months to prepare but as I was already marathon fit I was "confident" I had a great foundation for this challenge. Preparation for ultras is very much like marathon training with the only real difference being the weekend "long" run is longer and slower or involves running back to back long runs. My training was going superbly until Tim and I decided to recce the Frostbite course in December, a month before the race. I cant recommend doing a recce of your chosen course enough and on race day we both benefitted from it hugely as many competitors struggled to navigate something that was by now 2nd nature to us. What I do not recommend about doing a recce is twisting your knee and decimating your final 4 weeks of training before your race. The twist did not seem serious when I first felt it but over the next couple of days it swelled massively and I was unable to run at all for the following 3 weeks. This essentially meant that from the 30 mile recce the only running I did in the final 4 weeks upto the ultra was a couple of 10 milers in the final week before the race. In terms of preparation it was about as bad as it gets and in hindsight I should have withdrawn. Lesson number 1 learnt from this experience is that preparation is absolutely everything and ultras are not a place to realise you are woefully undertrained. 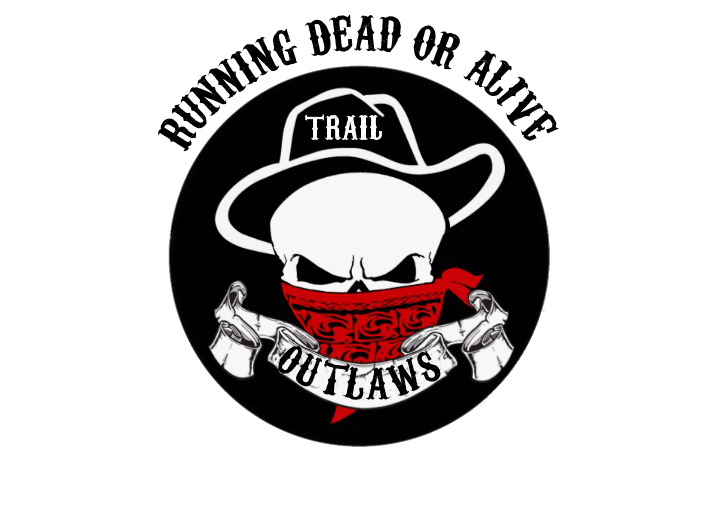 If you are not on top of your game going into an ultra, withdraw and live to fight another day, this mistake was to cost me nearly 4 months of running after the race. Despite my broken prep race day arrived and I felt really confident. I knew that I wasnt going to run to my full potential but ultras are all about finishing and i was still confident I would achieve that. The first 20 miles of the race went according to plan, infact I was running well and despite awful conditions was feeling really strong. I had also just traversed one of the worst sections of the course, a section I had been absolutely dreading and had flown through it and was now approaching a welcome checkpoint. Then disaster, as I slowed from my run into a walk CRACK, the pain shot up my leg from my ankle and I screamed out in pain. I had badly sprained my ankle and was struggling to walk. I spent a few minutes in the checkpoint and had a decision to make, the sensible thing to do was to withdraw, the ankle was agony, there was 30 miles to go on an awful course and I would live to race another day.....But this is ultra running and ultra runners simply do not know when enough is enough. I made the decision to move on and see if I could get to the next aid station....Within minutes this seemed like a crazy decison as I once again turned the now "loose" ankle ligaments, this time it resulted in me plunging full length into a puddle infront of two other highly amused competitors. Again I picked myself up and slowly "ran" and speed walked on. Slowly the miles passed, I made 30 miles and despite having to think about every foot placement I was beginning to feel a little more confident, bad mistake as once again the ankle gave way, this time leaving me sprawled in the middle of a field and I am not ashamed to admit in tears of pain and frustration. At this point the course actually did me a favour. I was midway between checkpoints, it was getting cold and it was getting dark, I had no choice but to pull myself together, get a grip and push on as to wait for help would actually take longer than to hobble on. 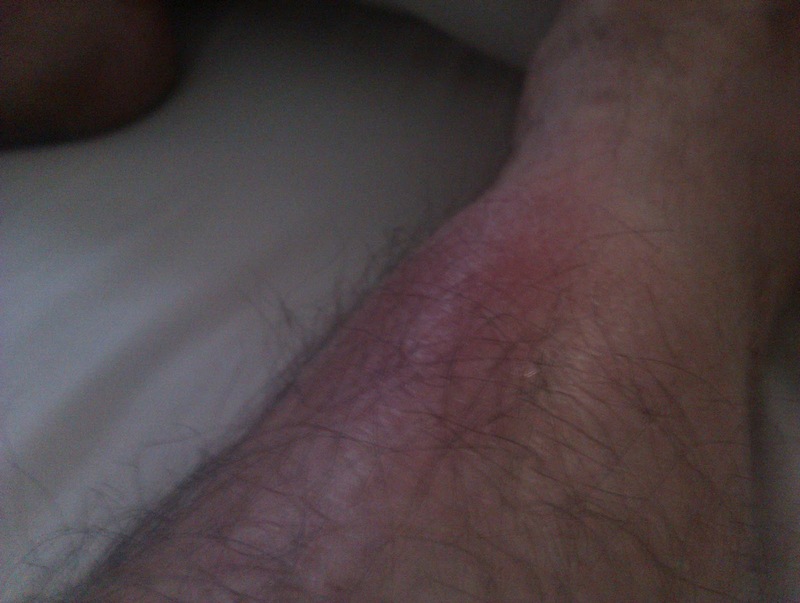 By this point as well as the ankle issue I was starting to get a nagging pain in my right shin. Over the next few miles this pain was to get worse and worse and while not realising at the time this pain, and not my injured ankle would ultimately end my race. I got into the 2nd to last checkpoint, the temperatures had dropped below freezing, I was making slow progress and I had pretty much decided to withdraw. This is where the fantastic marshalls kicked in and brought me back from the brink. Having "run" the last few hours upto my knees in swamp water I was freezing cold and soaking wet. I had a change of socks with me but my hands were so cold I needed a marshall to remove my shoes and change my socks for me like a child. Its sounds crazy but those fresh, warm dry socks, combined with a cup of hot soup changed my whole outlook and within minutes I had made the decision to push on to the end which was now just 15 miles away. Psychologically I had turned a corner and confidently pushed on. This however was a positive peak I would not reach again. Over the next 10 miles my injuries, particularly the shin worsened and bit by bit the increasing pain, the cold and fear of turning my now wrecked ankle again simply broke me down mentally. As I arrived into the last checkpoint and just 5 miles from the end of the race I realised that to continue onto the wet slippery cliffs carrying the injuries I was and in these temperatures was not only foolish but dangerous. My first ultra race had ended prematurely after 45 miles and nearly 12 hours and I was utterly gutted. It is only now I reflect upon my experience that despite my DNF, far from being a failure I had actually proven everything I needed to that day and more. 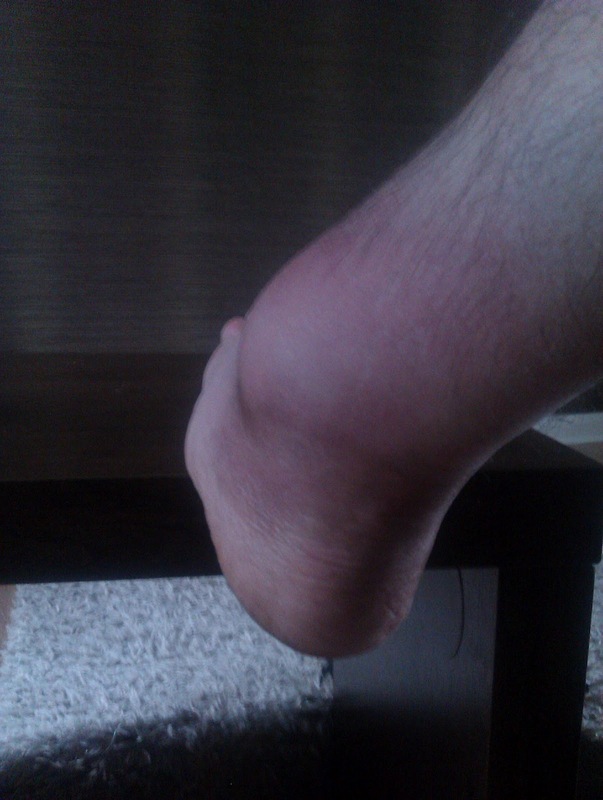 I had run 25 miles, virtually an entire marathon on an ankle that you can see from my pictures should have ended my race the moment it had happened. This injury, and keeping my weight off it had meant I had put pressure on my good leg which had led to horrific shin splints that were going to keep my out of running again for 4 months. (see other photo). My preparation was awful, I had got injured (partly as a result of my poor prep for the race) but I had run through more pain than I want to think about and had come through the other side. Everything I had read about ultras said that the real battle in an ultra race would not be the physical one but the mental one. I discovered on that moor that day just how far I could push both my body and my mind. Ironically had I not been injured I would undoubtedly have finished the race but in a strange way the way things happened actually pushed me further physically and psychologically then I had ever been before. 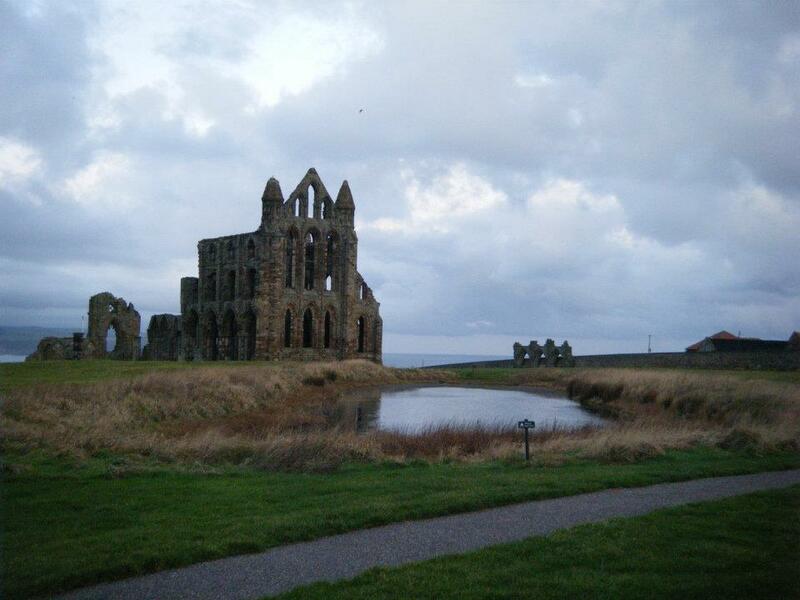 Again despite my DNF I am supremely confident about finishing my next ultra, the Hardmoors 60 in September of this year. I now know that whatever it throws at me I can battle through adversity and pain in bucket loads and come back fighting. What I have also learnt though is that the old adage that you fail to prepare and you prepare to fail is no better proven than in the middle of an ultra. There is no place to hide in an ultra and the greatest lesson I have learnt is to be honest with yourself. I will never line up at the start of another ultra race if I am not on top of my game as like most ultra runners I dont know when to say enough is enough. During the heat of battle, finishing is everything, you have to have this mentality when you run ultras or you would never finish them. Unfortunately that same mentality could potentially result in you doing permanent damage to yourself. A painful lesson learnt without any lasting damage but one I will never forget. Navigation - If you can recce the course then do! We got misplaced three times on the recce and this saved wasted effort and time. The confidence of knowing the route made the running much easier on the day. Hydration and food - I had tried flap jacks on a few of my longer runs and they seemed to work quite well. Whilst shopping at Home Bargains I came across the 20 pence flap jack which became my primary fuel source for the run. At around mile 30 my body told that it would not accept any more flap jacks. Luckily there was a great selection of food at the aid stations. My foods of choice to the end were apples and sweet tea. I also carried trail mix and jelly babies. I also think I did not drink enough water (See conclusion). So I know try and mix regular food with foods such as flap jacks as gels, as trying to eat too much of the same food does not work. Pacing - I started slowly as per the photograph I am towards the back of the field at the start. (I am the one towards the back with an orange hat on) Pacing strategy worked well and I made my slowly through the field. I walked most climbs and difficult to runs sections. I lacked a bit of running in my legs from 30 miles due to muddy conditions and also due to possibly not taking on enough food and water. My final position was 15th in a time of 10:27. My target time was somewhere between 11 and 12 hours so was delighted with my time. Do as many runs as you can wearing all the equipment and carrying all the gear will be running with. Running with 2 litres of water and full kit on rough ground is very different from running on smooth trails with no equipment. The 35 mile mark was a bit of a dark point in the run. Thick mud made it difficult to walk, never mind run. Also I know I was starting to feel tired. At this point the I understood better that it is the mind that can push the body on at difficult times like this. Learning to run in the dark with a head torch was good fun and something I would like to do more of in the future. The only slight problem for me on the race was itself was there was no frost! So the course was very muddy in places, which certainly added to the challenge! Maybe the key lesson learned was hydration and possibly led to me needing to find out about a special formulation called preperation H after the race! Oh and take your own photographs,as I have not really got any photographs of the event itself :) I look forward to doing other events organised by Adventure Hub in the future.